The goal should NOT be to collect trinkets or coupons. The real prize of the Summer Reading Club is the fun of reading awesome books for free all summer long! Okay, we have prizes to motivate kids to read. And we expect that many of the kids may be more excited about getting a free ice cream or a toy than about reading. But parents, we need you to concentrate on the actual goal of the Summer Reading Club and gently steer your kids in that direction. And the actual goal is NOT to collect a thousand cheap plastic toys or stuff the grand prize entry box with entry slips. The actual goal for your child is to keep up his or her reading skills during the summer break from school. The Summer Reading Club is one of those things where you get out of it as much as you put into it, and kids are going to follow your lead. If you emphasize the importance of tangible prizes above all else, that's what they're going to come to value. Alternatively, if you emphasize the intrinsic value of reading, learning, and practicing skills, that's what they'll value. 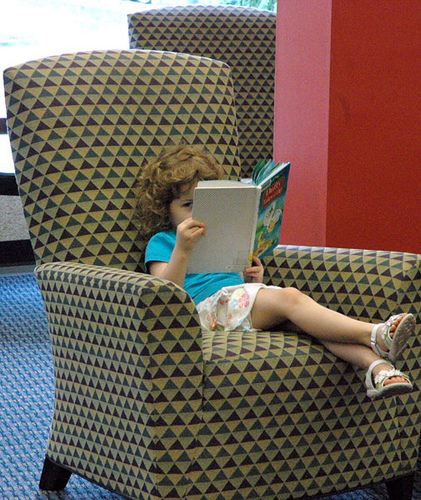 Joining the Summer Reading Club does NOT mean you have to come to the library every day. Summer Reading Clubs differ from place to place, but typically libraries reward kids for reading (anywhere - home, on vacation... anywhere!). Some libraries do have programs in place that reward kids for visiting the library on a regular basis. Hey, if the Summer Reading Club requires your kids to read a certain number of pages or books, count 'em up before you bring your log in. Not only does that make it quicker and easier for you to get your prizes, but it lets your child practice their counting or addition! If the reading log asks for a list of book titles, let the kids write titles in their logs if at all possible. Literacy is reading AND writing. Letting your kids fill in their own reading logs helps them practice their writing skills over the summer, too. Bonus! If your kid's reluctant to do that, offer to switch off with them and ask them to write every other title. Please be patient as we check out (and check in) your books! Hundreds of families are checking out books every day and mistakes may happen! If you think you returned something but it's still checked out on your account, let us know asap and we'll look for it! We also appreciate your patience with, well, all librarians during the summer. We want to help you, we do. But sometimes we have five programs in one day and hundreds of kids coming in to sign up and/or check in for the Summer Reading Club. We might have to help some other people first. Please, please be patient with the librarians during the summer. We love for you to come to our programs! Program attendance may be limited due to space, supply, or performer restraints. Check to see if you need to pre-register for a program and call to reserve your space as soon as possible. If you find you're not able to attend, please call and let us know. We can give your space to someone else who wants to attend the program. I promise librarians understand that things come up, especially when dealing with kids. We won't be mad if you call to cancel! We might get frustrated if you don't show up and we had turned someone away because the registration was full. Assigned summer reading from the school is different from the public library's Summer Reading Club. If you wait until 2 weeks before school starts to tackle your summer reading assignment, you might not be able to get the book(s) from the library. Even if just one teacher assigns a certain book as summer reading, that could be as many as 20-30 kids trying to get it from the library. And the chances that we'll have 20-30 copies of the same book? VERY slim. We really do try to have those books on the shelves, but we don't always know about school assignments until people start coming in and asking for the books. And we're not always able to buy lots of copies of the same book. Getting the reading done early will ensure that your child has access to the book(s) he or she needs. And if you wait until the last minute, it's amazing how a librarian's sympathy for your plight can dry up. If you do wait until the last minute for your assigned summer reading, consider alternate sources for the book. Can your child borrow it from a friend? Can you buy it from a bookstore? Does your teacher or school have copies they can lend out? If your library has reciprocal borrowing, can you get the book from a neighboring library system? Might it be available online through Google Books or an online database to which your library subscribes? If you do get the summer reading assignment done early, please return the book ASAP. So, librarians, what else do we want patrons to know about the Summer Reading Club? I've been at ALA most of this week, but I'm happy report that we're 6 weeks down and only 4 weeks to go! My library's got just over 1900 kids and just over 400 teens signed up for Summer Reading. These are numbers that make me happy! This week we had the zoo come and started our teen Anime Club. Summer Reading Club post roundup!! Anyone else post an update on your Summer Reading Club this week or last week? Leave me a link in comments and I'll post 'em here. ALA: Here's Where I'll Be! 48-Hour Book Challenge Starting Line!